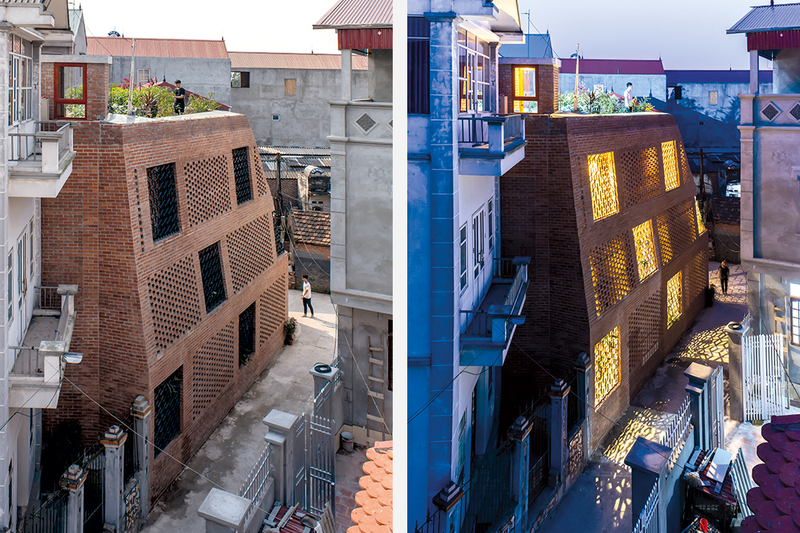 H&P Architects have created a chain of interconnected spaces in this unusual brick house in Hanoi, where daily life is layered with glimpses of plants and the sky. 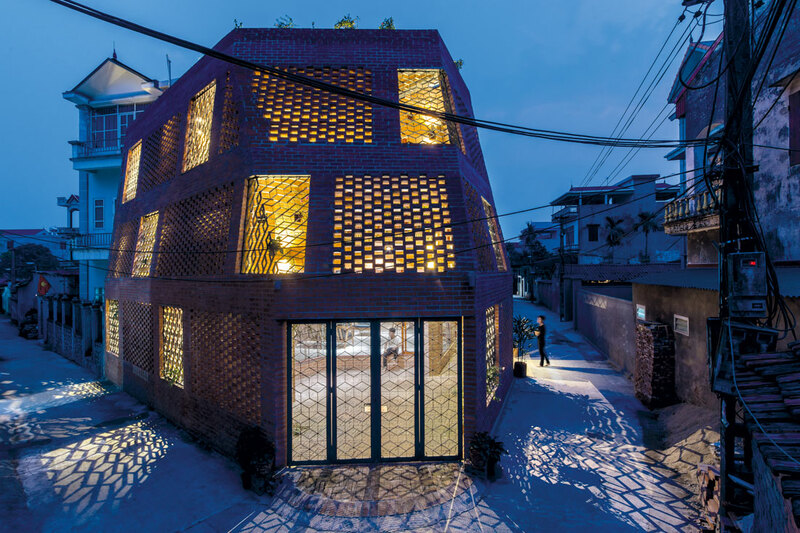 Brick Cave is a two-storey brick house in a small village in a northern suburb of Hanoi. 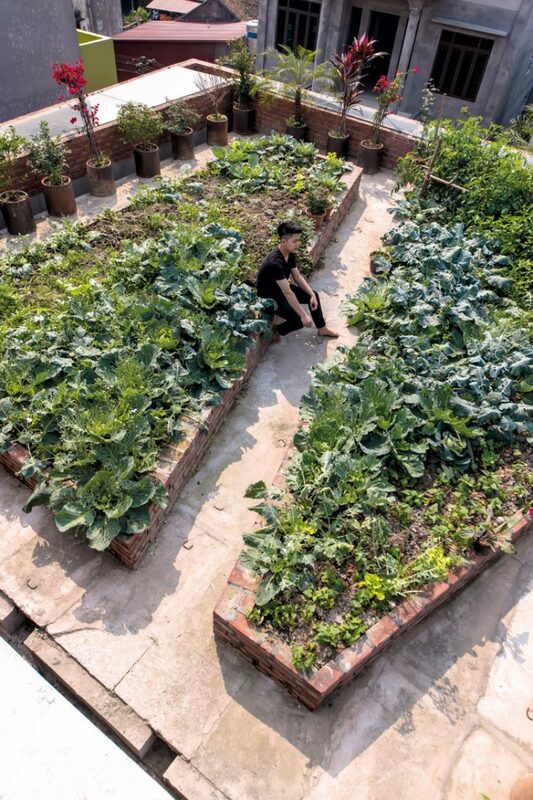 The 175-square-metre plot of land was originally an ancestral vegetable garden, inherited by a son who lived far away. Now he has come back to his homeland to live near his mother. Normally, people sell half of the land they are given and build a house on the other half; thus, much of the green area in the village has been developed into dense blocks (much like urban houses) with muted side walls that lack windows. Many typical features of villages, such as community courts, neighbourhood communication, and a peaceful and airy atmosphere, are lost. Bordered by two lanes but taking a distorted shape, the land on which Brick Cave sits faces west and has no significant natural features except a few trees at the corners. 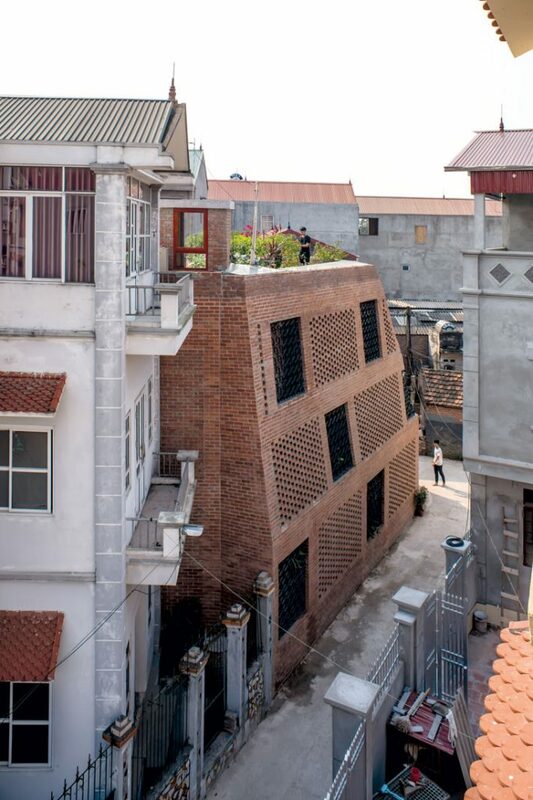 On this plot, H&P Architects have designed an abnormal house, which meets human demands for diverse uses while fitting the context of the location. The 20-centimetre-thick reinforced-concrete floor allows two bedrooms and a bathroom on the upper floor without any structure below, accommodating spacious shared areas on the ground floor for flexible usage by the large family: worshipping, receiving guests, cooking, dining and parking. In particular, there are a lot of playing areas for kids from the three or four families that live nearby. 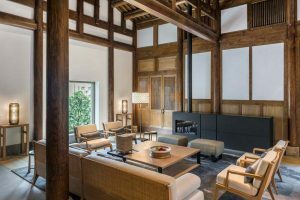 The owner confides that his sons who are working in the city still want to come and live in this house after their retirement. 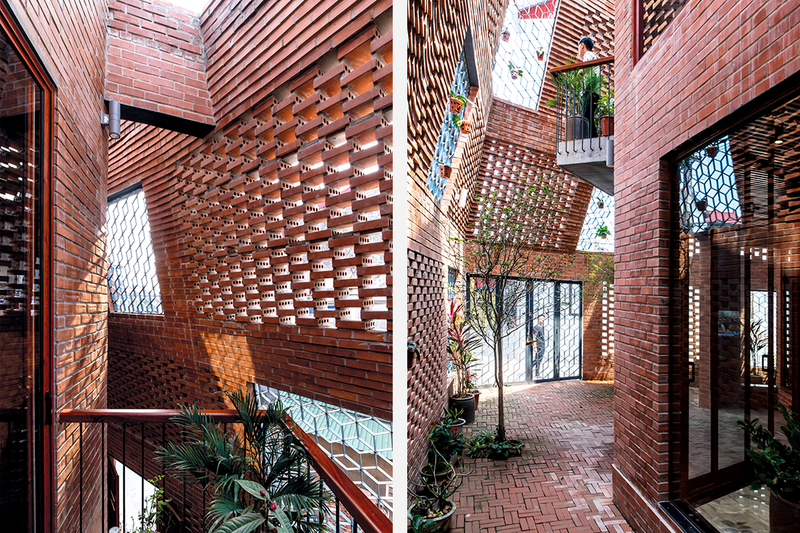 H&P Architects have developed a ‘double skin’ principle for the walls. 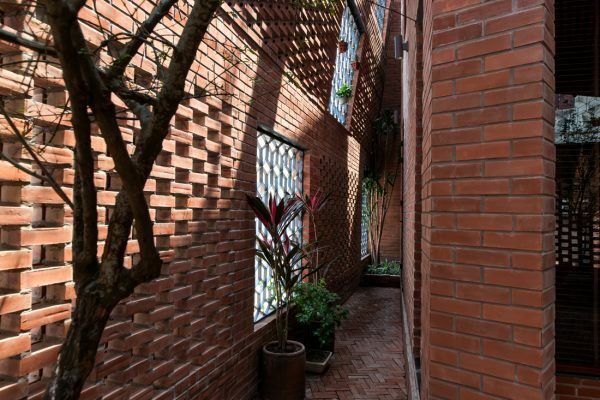 An outer layer (of ‘fences’) and inner layer (of ‘facades’) of non-parallel thick brick walls create tall and spacious buffer spaces around the house for ventilation and heat isolation. They also blur the boundary between the inside and the outside. 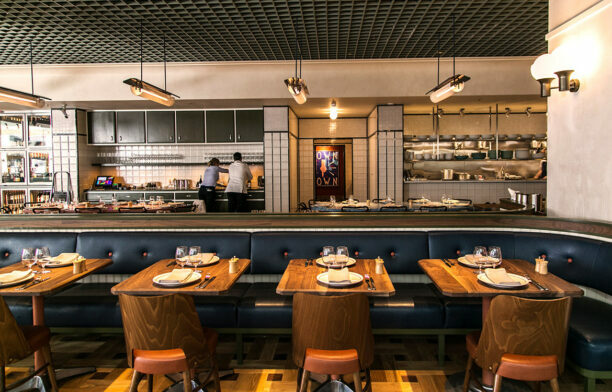 The outer wall has multiple openings with appropriate patterns that make people feel safe and private yet not constrained nor isolated from the outside world. 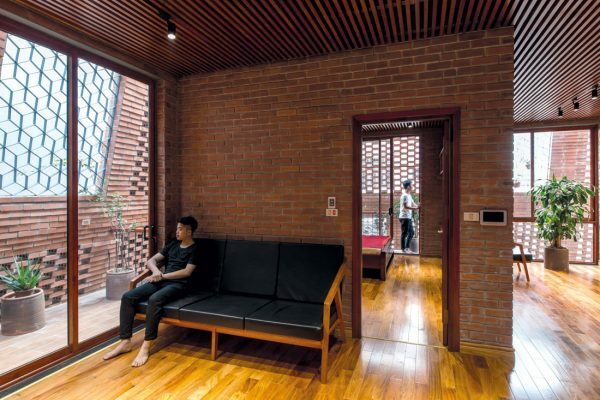 Much like a cave, the Brick Cave house is formed with thick walls for heat isolation and interconnecting spaces for ventilation. The spatial and light effects of a natural cave – low (entrance), wide and high (main volume), narrow (corners), opening outward (windows), bright (outside), dark (inside), light (from above) – create non-repetitive forms and images. Nothing is absolutely perfect; there is no unified grid, and no rectangular or symmetrical space. Rather, architecture is the ‘organised randomness’ in the natural artificiality. 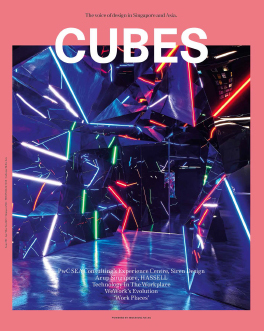 Read the full story in Cubes 93: Designing Well(ness), on shelves now! 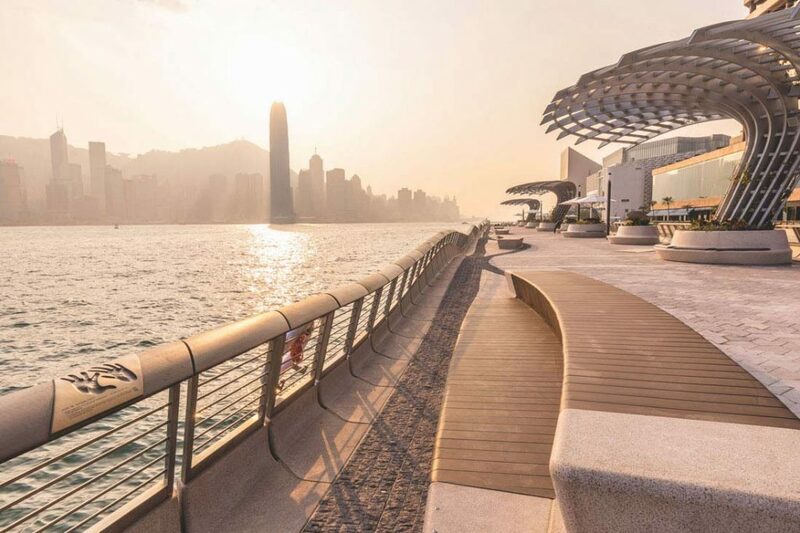 Amanyangyun Shanghai, Middle House Shanghai and Tsingpu Yangzhou Retreat received the most awards at AHEAD Asia 2019 in Singapore. Here is the complete list of winners! Despite the old saying, walls do talk, and they speak volumes about the people living within them. 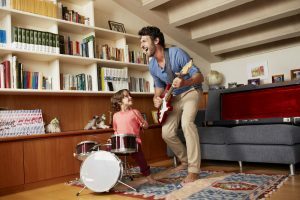 Here are a few tips to inject your personality into your home from Schneider Electric. 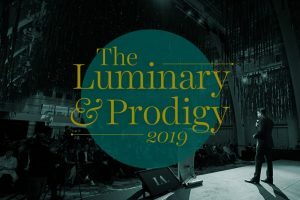 People’s Choice voting is now open for The Luminary and The Prodigy. These eight incredible individuals are taking our region to new and exciting places. Have your say and vote for your top Prodigy and Luminary of the year. Tan Szue Hann recently joined Taiwan-headquartered ‘RD&D’ company MINIWIZ as the Managing Director of its new Singapore office. 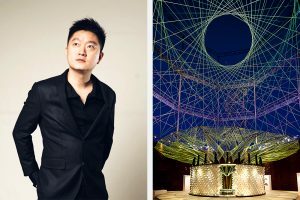 We hear about his passion for producing architecture and design within the circular economy.